There was a shingle mill on the Wells Forest property in the mid-1800’s. The large rock wall that remains on both sides of the stream is related to this shingle mill. This page holds the history we know about Wells Forest. There was a shingle mill on the property that was very busy. 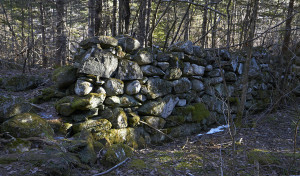 It is nearly 200 years old and a stone foundation still can be found on the property where the shingle mill once stood. Many years ago, Sunkhaze Stream was backed up into a lake here where the men would move the logs down to the shingle mill. The property was in a heavily cut, high graded state when it was purchased in 2004. Over time, the owners of Wells Forest realized that to repair their forest for future assets, they needed to learn more about how to take care of a forest and to build a team that knows how to manage a forest. With that goal in mind, Pam Wells returned to UMaine for forestry classes and created a team with professionals such as: her consulting forester Kirby Ellis, logging contractor (Scott Madden and Madden Timberlands,) local Natural Resources Conservation Service staff, and students and professors from the University of Maine School of Forest Resources, as well as professionals from other disciplines.